‘All things have their sympathetic note,’ Pete Mullineaux writes, and this collection of rare beauty and understanding takes us from the universal presence of sound in nature and everyday life, to its manifestation in traditional music. Here Mullineaux has captured the rituals and subtleties of the form, from the first, sometimes faltering, initiations of the musician through the extraordinary energies and relationships that emerge in performance. Traditional music is characterized by an awareness of the past, place, people, and occasionally protest while its greatest musicians reanimate the familiar tune with surprising additions, changes and often great humour. Mullineaux’s poetry exhibits all of these qualities giving the reader an illuminating insight into this music and the places it inhabits, particularly the west of Ireland. Session (the word used to describe informal gatherings featuring traditional Irish music) is Pete Mullineaux’s second publication with Salmon. At age 13, his poem, ‘Harvest Festival’ appeared in Macmillan’s anthology Poetry & Song and this latest collection continues a lifetime fascination with the twin worlds of poetry and music – (Pete plays guitar, mandolin and fiddle.) Here are lyric, narrative and song elements, exploring and celebrating the presence of music in human interaction and in nature – there is a particular empathy with animals – from starfish, spiders, dogs, and cows through to a whole range of birds. Paying tribute to the ‘music’ in poets such as Heaney and Yeats along the way, this is an innovative, sometimes humorous, but ultimately a serious and thought-provoking creative study. Pete Mullineaux originates from Bristol, UK. At age 13 his poem ‘Harvest Festival’ was published in two anthologies, Poetry & Song (Macmillan) and Man & His Senses (Harrap) as well as being recorded by Argo records alongside music and song from Ewan MacColl & Peggy Seeger. Living in London for several years, he worked in a left-wing printing press and was part of the alternative music scene with the punk rock band The Resisters, then as singer-songwriter, Pete Zero. Adapting to the emerging wave of performance poetry, he appeared in the Apples & Snakes anthology Raw & Biting Cabaret Poetry, (Pluto Press 1984) and won the City of London Poetry/song contest in 1986. In 1991 he moved to Galway with his partner and daughter, where he works as a creative writing facilitator and drama devisor with local and national community/arts/campaigning groups. He’s particularly involved in development education and is a mentor on Poetry Ireland’s Writers in Schools Scheme. His poetry has been published widely in Ireland, UK, USA and France – with two previous collections: Zen Traffic Lights (Lapwing 2005) and A Father’s Day (Salmon 2008.) Readings range from Cúirt International Festival of Literature to Electric Picnic, New York to Glastonbury. He also writes for the theatre and has had a number of plays produced by RTE radio. The surface on the canal tonight: black cellophane. flapping brings wind and sound to the picture. Perhaps the most prominent feature of the poem, for me, was its tone. It’s the only poem I’ve come across where the first word I’d use to describe it (and especially its tone) is “patient”. And that’s despite the use of run-on lines, which usually create a sense of urgency in a poem. There’s an odd mix of the quiet and the melodramatic here. Odd in the sense that the combination works so well. It’s quite like a classical tune luring us into lulls, followed by crescendos such as “tuning feathers; then like a great winged / accordion at the heart of this session, flamboyant / flapping brings wind and sound to the picture”. At heart, this is a nature poem which, in many ways, feels like a poem about people. Maybe we are so used to birds doing very bird-like things such as flying that the unusual descriptions here resonate on a deeper level. And it feels as though simple acts such as dipping and diving have extra meaning for the animals themselves. Conveying this is evidence of the poet’s skill, and such deeper meaning is, I think, something we associate with good poetry. The Bristol born, Galway based poet, author and playwright Pete Mullineaux knows his way confidently around traditional Irish music. His poetry collection, Session, (Salmon Poetry), dedicated to his mother, with artwork by Fran McCann, is guaranteed to leave his readers wanting more. The poetry, like the regional variations in the music, varies in style and tone, the common link being the poet’s voice as a silent observer. Mullineaux uses evocative images, insightful observation, humour, playfulness and nostalgia. He is a scrutiniser of intricacies, a watchful eye, someone who listens to the tunes and observes the people who play them. The reader sees the players’ eyes, fingers, their bodies, the body language and the resulting inter-personal and inter-musical relationships being formed. Mullineaux also explores the emotions and psychologies of his subjects with curiosity and admiration. ‘The Five Mile Chase,’ is a tribute to Patrick Street. Andy Irvine, John Carty, Kevin Burke and Jed Foley have their individual stage movements noted and matched to rhythm, playing styles and character nuances. ‘A tilt of the chin for the pigeon on the gate/ a bend in the waist for the stack of wheat/ a wink in the eye for the blue eyed rascal/ a slip in the hip for a trip up the stairs.’ It’s a twelve line piece that could be sung in jig time. Hup! This aptly titled collection, Session, by Pete Mullineaux is a gem. Encore, si’l vous plait? It is available from www.salmonpoetry.com, bookshops and music stores. Pete Mullineaux is a man on a mission. That mission is to inspire as much creativity and imagination and across as many different forms as there are out there. If ever there was a man to exude creativity, it is the amiable Bristol man. A Jack of all trades in the arts world, he is a published poet, songwriter, musician, dramatist, actor, comedian, educationalist and lately, just for relax- ation, a fiddle player. This week he turns his attention to two favourite themes that crop up often in his writing: fairness and equality. As part of the Baboró children’s arts festival, Pete is holding workshops with national school children which encour- age them to write poetry which will tip the balance towards a more just and equal society. Held in association with Poetry Ireland and Trócaire, this poetry encounter is designed to get kids to think creatively about the world and their place in it. “There’s so much information out there. We know there are 250 million child labourers in the world for example, we know there are 25,000 who die every day from hunger. But our leaders seem to lack the imagination to do anything about it,” he insists. The workshops instill confidence in young people to express themselves and help them get over an innate fear of being wrong which can dampen cre- ativity, he believes. “It’s about knowing the importance of having a voice. We have a voice to articulate the imagination, we can sing, write, draw – but a lot of people don’t have a voice. This is about instilling the confidence in themselves that what they feel and what they think matters." Free workshops are also being held in the Galway City Museum for families on Saturday to allow parents to compose poetry with their kids, creating a rich memory for posterity. Much of Pete's working life involves teaching, al to of it teaching poetry to school kids of alleges through his association with Poetry Ireland, which runs the Writers in Schools Scheme, one of the longest running arts-in-education programmes in the country, which is funded by the Arts Council. He leads a regular creative writing course in Oughterard as well as other creative writing courses with older people throughout the city. He teaches act- ing classes in the Galway Arts Centre and works with the Galway Youth Theatre, training the young actors in the art of devising plays. Outside of teaching, there is his own writing. He has published three collec- tions of poetry, the last one in 2011 entitled Session, which is inspired by his love affair with the fiddle and the regular music sessions. One of his favourite ways to relax is to get lost in the fiddle with the Dusty Banjos, a community session for beginners and improvers held weekly at the Western Hotel in Prospect Hill. Pete’s previous poetry collection was A Father’s Day, featuring stories about dads and dedicated to his own father, “an extraordinarily caring and kind and self-sacrificing person”. That came out in 2008. The first was called Zen Traffic Lights, which was published in 2005. The very first poem he had published was when he was just 13. His class was asked to write a poem inspired by the annual harvest festival and the poem, Harvest Festival, was featured in the school magazine. McMillan Publishers then wrote to him asking if they could include it in an anthology featuring such luminaries as Keats, Yeats and Shakespeare, called Poetry & Song. But it was music rather than poetry that took over his life when he moved to London in the late 70s. He played in a punk band called The Resisters before going solo as Pete Zero performing in two Glastonbury Festivals, once sharing the stage with the Pogues. Protest singers such as Bob Dylan and Woodie Gutherie were his biggest inspirations. His top hit was Disposable Tissues, which the BBC chose as their crazy song of the week. It was in London while working for a campaigning group for the elderly that he met his wife-to-be, Moya Roddy from Dublin, who was also a writer. When the couple’s only child Cass had turned two, they decided to move to Roscahill in Connemara where they had friends. Unsurprisingly his daughter, now 22, is big into the arts but has chosen to study law and German. Moya continues to write and has published a novel, short stories as well as plays for theatre and the radio. The couple have frequently collaborated and in 2010 they wrote the radio play, Butterfly Wings, which aired on ￼RTÉ. To wind down he plays the guitar and now the fiddle, which he believes is excellent training for him. “Learning the fiddle reminds me what it’s like to be on the receiving end. I do a lot of courses with active retirement groups and many of them are afraid of writing, they might have had a bad experience with it. Learning the fiddle is so difficult. It helps me to keep in touch with how scary learning can be,” he explains. “The fiddle is where I go into another place. You can only play it when you get into the zone. I like to play in the bathroom. I went to a Martin Hayes workshop and he said he loves my poetry – I have poems about the fiddle. He too likes to play in the bathroom,” he grins. As well as the teaching, he runs the poetry “slam” at the Galway Arts Centre and MCs a “Grand Slam” poetry final at the Cúirt literary festival in the city in April. He also hosts a Cúirt slam at the Electric Picnic festival mind field area in Stradbally every year. Pete is currently working on a sci-fi children’s book aimed at the 12 or 13 age group. The book’s other main preoccupation is water, specifically the otherness or confusion of being in its presence. ‘[A] compromise / with nature, to survive in water / you meet your nemesis half way’ (‘Boats Marinating’) and ‘Today we came upon two animated swans / with their fluffy young, taking the tarmac / away from the river / like refugees’ (‘Dry River Blues’) allow the poet to explore this displacement alongside that of the music. For he is an outsider, an immigrant to the rural rooms of Galway and Mayo, and in this sense he knows that to relay the music accurately is somehow to be on the inside looking out rather than the reverse, and this frustration is evident. The problem with much of this collection, fine though it is, is that these pastoral, almost private readings thus often lack external relevance. It is possible to read a few pages at random without realising that you read those same pages some hours before. As the poet says in ‘Naming the Tunes: Swinging on the Gate/The Cup of Tea’: ‘Music or thought, which comes first? / What subliminal transaction occurs [...]?’ Yet this is not to say that the poems are not worth rereading, or do not contain levels of meaning which can only be discovered with time, but merely to suggest that in dwelling so often on the causes of music rather than its effects leads to repetition, if not in language or syntax then in tone. That the poems about the performance of music are slightly esoteric is unsurprising, but in looking past the sounds themselves and concentrating on what they might represent Mullineaux crafts genuine and perceptive surprises. More, please. Recently I attended the 2012 Over the Edge Poetry book Showcase in Galway with the hope of discovering some new poets I haven’t heard before and purchasing a few books for my collection. It was a successful night and luckily I found some excellent poets I wanted to read. One such writer is Pete Mullineaux, a Galway based writer who captured my ear with his readings from his poetry book ‘Session’ that I found myself crying out in my head “Pete Mullieaux-where have you been all my life” and I sincerely mean this in context that Pete has been living in Galway a long time, yet I have never crossed his path, must be a large rock I’ve been slouching under. Session, brought out by Salmon Poetry in 2011 is a beautiful magical book, soaked in waves of musical imagery and sound. In a time when a lot of contemporary writers are concentrating on letting us know how crap life really is, it is a pleasure and relief to read a poetry book that transports us to the beauty and magic of music, nature and every day life, written with impeccable craftsmanship, a delight on the ear and begs to be read out loud. “All materials are alive” is the first line in the poem “A Slow Start To The Set” and Pete manages to bring this statement alive through his words throughout the book. The poems are full of images of Irish traditional music, of Pete himself, learning or playing the fiddle. Energy frantically shakes these poems off the page. Song and lyric engage the reader with humor, reminisce, narrative, the love of the natural world through dogs and spiders. Brilliant stuff and just a taste of the imaginative and intelligent poetry waiting to be discovered in ‘Session’. The title of this book “Session” is a word used to describe informal gatherings featuring traditional Irish music, and it certainly rings true right through this book. I found reading these poems could easily change your mood, drag out all different types of emotions, tenderise the heart, put a smile on the face and make you laugh, a triumph for modern Irish poetry, a great find, now I must attend more book showcases like this as it really pays off. 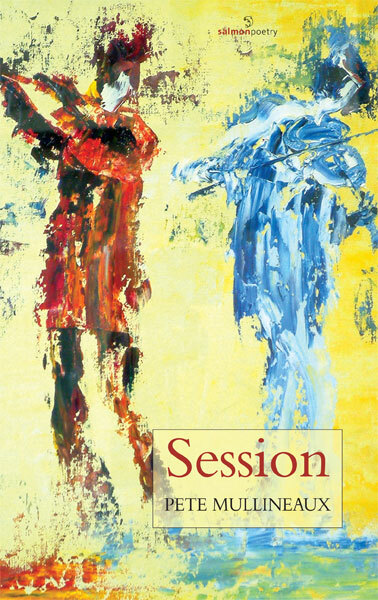 SALMON POETRY has published a delightful new collection by Galway-based poet Pete Mullineaux entitled Session. The poems are all related to music and sound, and links both with human interaction and nature. There is a strong presence of Irish trad as Mullineaux has been learning/playing fiddle for some time now and in many ways this is a celebration of the music and the musicians – some poems relate to actual musicians and performances. There is also a strong presence of the Galway city and county landscape, and the western seaboard from Clare up to Donegal. Besides the lyrical element there’s also a voice of protest in several of the poems which perhaps derives from Mullineaux’s work in the creative writing and drama field where he is involved with many diverse groups – Travellers, asylum seekers, environmentalists, people with learning difficulties. Writing in praise of the book, author Sean Crosson observes: “This collection of rare beauty and understanding takes us from the universal presence of sound in nature and everyday life, to its manifestation in traditional music. “Here Mullineaux has captured the rituals and subtleties of the form, from the first, sometimes faltering, initiations of the musician through the extraordinary energies and relationships that emerge in performance. Mullineaux has been living in Galway for 20 years but originally hails from Bristol. Today the city is one of Britain’s most vibrant cultural centres but that wasn’t the case when Pete was growing up, as he recalls over a morning phone call. Session is Mullineaux’s second poetry collection with Salmon, following A Father’s Day which appeared in 2008. The new volume is dedicated to his mother and it is to her Mullineaux attributes his lifelong passion for poetry and the arts. “My mother was an actress,” he reveals. “When she was young she ran away to join ENSA [the organisation that provided entertainment for British armed services]. When I was young she used to tell me stories and introduced me to poetry and I am forever grateful to her for opening that world up to me and that’s why I dedicated the book to her. Mullineaux was only 13 when his poem ‘Harvest Festival’ was published in two anthologies, Poetry & Song (Macmillan) and Man & His Senses (Harrap) as well as being recorded by Argo records alongside music and song from Ewan MacColl and Peggy Seeger. Some years later Mullineaux gravitated to the London punk rock scene and became a singer and writer with The Resisters under the name Pete Zero. In 1991, Mullineaux and his family made the decision to leave London and relocate to Galway. Throughout the book there are also doffs of the hat to poems and poets that Mullineaux admires with the appearance of brief phrases from poems by the likes of Ted Hughes, Les Murray, and John Montague.